Battery Energy Storage System – Alice Springs is set to receive its first grid-scale battery as solar power in the Northern Territory heats up. The $8.3M, 5MW/2.5MWh grid-scale battery storage facility in Alice Springs was announced last year and has been completed this week. It was built by New Zealand solar company Vector using LG grid-scale solar batteries. 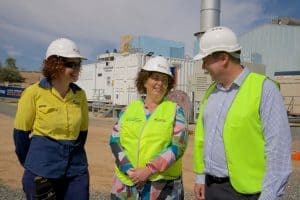 “The Battery Energy Storage System is an important milestone in the Northern Territory’s transition to renewable energy and a critical piece of infrastructure to support the Northern Territory Government’s Roadmap to Renewables strategy,” Territory Generation Chief Executive Officer Tim Duignan said. “Reliability and stability of the power system is a critical barrier in the uptake of renewable energy across Australia, and I am pleased that we are at the forefront of tackling this issue right here in Alice Springs,” he continued. The BESS should have quite a big impact on base-load power as well, so let’s see how it fares during summer 2018/19. Previously a very conservative approach to local grid management (read more in RenewEconomy) means this battery should help quite a lot: with half an hour storage capability, and can supply 8MW for 6 seconds, or 7.5MW for 60 seconds – suitable for the moments everyone decides their air conditioners need to be turned on at the same time! We wrote about the Battery Energy Storage System (BESS) last June as it was unveiled in an attempt to compete with the other states, where the Northern Territory was lagging behind considerably (January 2017 PV output was 4,049MWh vs Queensland’s 126,629MWh). The Northern Territory is in a very unique position compared to its neighbour states – the state hosts a mere one percent of the total population but it represents approximately 15% of Australia’s land mass. However, installs are more expensive over there due to less competition and higher cyclone ratings required on solar panels. This dearth of Darwin solar is starting to change and there are a raft of high quality solar installers working hard in Darwin, Katherine, Alice Springs, and more. It’ll be interesting to see how quickly they can catch up to the other states. Epuron are working on a 25MW Solar plant at Katherine. The Australian Defence Force have tendered for a 12MW of solar (combined) at their Darwin and Robertson Barracks. Rim Fire Energy Retail’s 10MW Batchelor solar farm. Infigen Energy are building a 12MW solar farm at Manton Dam and 10MW at Batchelor. Community solar project “Repower Alice Springs” is planning for a 10MW community solar farm. Darwin Solar – What’s Going On? As Australia’s sunniest capital (Darwin gets more sunlight year-round than any other major city – an average of nine hours every day), Darwin solar is certainly in the doldrums. As per the Australian PV Institute, the entire Northern Territory’s PV solar output as of January 2017 was a mere 4,049MWh (the lowest in Australia, less than Tasmania, and a ridiculous amount behind state leader Queensland who output 126,629MWh that month). What’s wrong with solar power in the Northern Territory, its capital Darwin, and what can be done to fix it? According to the Australian Energy Council‘s latest report, residents of the Northern Territory are paying the second highest for electricity in the country, behind Tasmania. 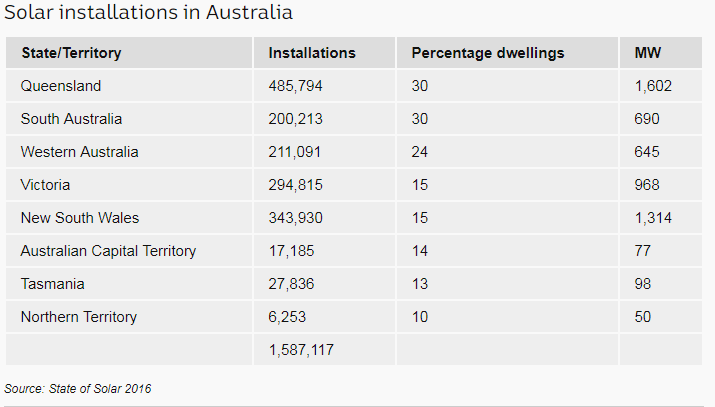 The ABC website quotes John Grimes of the Australian Solar Council that a third of homes (freestanding) in QLD and SA have PV solar installed on their roof, but this number is only 11% in the Northern Territory. The Northern Territory has a renewable target, which is to reach 50% renewable energy by 2030 – so it’s obvious that something needs to give if they’re going to get anywhere close to that. ABC quote an adviser to the NT Government, Alan Langworthy, who notes that the number of solar installations in the area is “artificially low” – noting that 40% of occupants in Darwin are renters, and as solar power for renters is still a tricky and mostly unexplored topic, it makes sense there will be less solar installations. “Having a very high transient [and] rental population in the NT tends to have driven down enthusiasm in rooftop photovoltaics,” Langworthy said. Also to note is that solar panels need to be signed off by a building certifier, which adds ~$900 to the cost of each installation. Perhaps another reason uptake has been slow is that back in 2011 when states were offering high tariffs to incentivise initial uptake, the gov’t offered 19.23c/KwH to feed back into the grid – in comparison to 44c/kWh in WA and QLD, or 60c/kWh like Victoria. Perhaps the answer is for the government to consider some sort of subsidisation scheme or generous tariff for residential solar – maybe something targeted specifically to landlords could be a step in the right direction. We will see what the NT have in store when they release their policy on how they plan to reach the 50% renewable energy target. It’s not all doom and gloom for the area, however – Alice Springs solar has been boosted by the $8.3m BESS (Battery Energy Storage System) which Vector Energy will be installing by late 2017 to help improve the reliability of base-load power for Territorians. We’ll wait and see what impact this has on Northern Territory solar and which steps they take in order to try and reach their Renewable Energy Target.